On behalf of The Amy Wallace Magpie Trust, Pam and Nick Wallace would like to express their thanks and gratitude to 'Team 3 Peaks'!! Mike Beatty - whose mad idea this was - deserves recognition for his endeavours. He rustled up a great team who threw themselves wholeheartedly into the venture. They have all given up their time to train for many months to give themselves the best possible chance to complete the task. We would like to thank and congratulate the climbers and the drivers for completing the challenge. All the generous people who sponsored the team have made the whole event completely worthwhile.The amazing amount raised will now be shared between the 3 chosen charities. The money donated to The Amy Wallace Magpie Trust will be used in conjunction with TCT to purchase nice things (non-medical) for the special young people at UCLH's Teenage Cancer Unit - where our daughter Amy was treated. Well Done 'Team 3 Peaks' and Thank You sponsors!!! At Teenage Cancer Trust, we understand that young people with cancer require specialist care. We know how damaging it is to take a young person away from their everyday life, their friends, their environment, their family – and put them in a cancer ward with small children or older people. Young people have a much better chance in their fight against cancer if they are treated by teenage cancer experts, in an environment tailored to their needs. So we’re working every day to make that happen. We don’t believe that teenagers should have to stop being teenagers, just because they have cancer. So we fund and build specialist units for young people in NHS hospitals. Our units bring teenagers with cancer together with loads of new friends of their own age so they can support each other. Alongside all of this is a medical team of teenage cancer specialists who pool knowledge to create a body of expertise that’s second to none. They’re backed up by our Nurse Consultants who provide clinical care, develop research, deliver professional education and ensure that standards remain as high as possible. Teenage Cancer Trust units aren’t like ordinary cancer wards. Everything about them has been designed to give teenagers the very best chance of a positive outcome. We want every young person with cancer in this country to have that chance. We estimate that with the units we currently have around the UK, half of the teenagers diagnosed with cancer now have access to this dedicated, specialist support. Our aim is to build enough units so that by 2012, every teenager in the UK will be treated on one. Amy was born a beautiful bouncing baby on July 21st 1994. Her first six years were normal and healthy but in march 2001, aged six, she was diagnosed with Acute Lymphoblastic Leukaemia. We were suddenly immersed into the medical world, desperately trying to understand terms, medicines and procedures. Amy quickly became sick and weak, prone to any kind of infection. The first treatment lasted 2 years and 3 months. During the first year Amy was constantly in and out of hospital and being subjected to the most horrendous medical procedures. It was heartbreaking watching our little girl suffer. Things gradually improved and by the end of treatment Amy was much better. Amy then had a great 16 months and caught up with things she had been unable to do. But, in September 2004, Amy relapsed. We were back facing this nightmare again. She was an inpatient until January 2005 again facing the horrors and feeling so desperately ill. Amy was in and out of hospital for the next two years until treatment finished in November 2006. Amy then had the most fantastic year. She joined a football club, played in matches and was awarded 2 trophies for her achievements. She lived life to the full and blossomed into a beautiful, happy teenager with everything to live for. Our lives were shattered again in November 2007. The beast had returned and this cruel disease was back. Amy was heartbroken. She knew the nightmare was happening again and the torture she had to face. She was immediately back in the London hospital and was in for the next six months during which time she suffered so very much. In March 2008 she had a Bone Marrow Transplant and things went well for 2 months but suddenly deteriorated. On may 30th Amy lost her battle. Amy had seven years overshadowed by illness, hospitals and medicine but never complained, always saw the positive side. As Amy's parents we feel it is an honour and privilege to have had such a brave and remarkable child. We also feel a huge sadness that this cruel disease caused her so much suffering and took away the life she so desperately fought for 7 weeks before her fourteenth birthday. Recently, Amy's parents - Pam and Nick have set up their own Charity in Amy's memory. The Amy Wallace Magpie Trust was named after Newcastle United Football Club's Mighty Magpie Mascot. All proceeds from 'The Three Peaks Challenge' will go to Amy's Trust which is established under the umbrella of the TCT Charity. Amy's parents hope to make a difference to a bunch of truely inspirational young people, of which their daughter was one. All the money raised through Amy's Trust will go directly to The Teenage Trust Unit at UCLH where Amy spent the last 6 months of her life. During the last year Amy's parents have been able to purchase and donate a mobile book trolley, approx 150 new books, aromastones for the side rooms, hats for the patients, cuddlies and chocolates at Christmas and Easter. All acheived in memory of their beloved daughter. A huge 'Thank You' from Pam and Nick, to everyone who donates to this special charity. Once again thank you so much for raising such a fantastic sum of much needed funds for our chosen project in Niger. Further to the message of our gratitude and information how the money will be spent from David Ould, I wish to add a huge personal thank you to you all for working so incredibly hard and achieving so much for your three chosen charities. We are extremely proud that the team chose One Voice for Freedom to be included as one of the beneficiaries of such a huge amount of funds. The mammoth of a challenge in climbing all three peaks is enormous. with every step you took, you made a massive difference to the entire community of slaves who now have a taste of freedom. This change will echo in the lives of not just the current community but their future generations too. Education and a healthier start to their lives in freedom is the most precious gift you could give to them. I am so proud of you all! Chair One Voice for Freedom. On behalf of One Voice for Freedom and Anti-Slavery International we would like to thank you and all the team for the great effort last weekend. Having climbed all three mountains myself (but not at the same time) I know the effort involved, and you certainly must have been exhausted after doing them all in the one day. The money raised by your efforts and the great support of all your donors will go towards the work of Anti-Slavery International in fighting slavery around the world, as can be seen on their website www.antislavery.org. We recently made a donation from OVFF to Anti-Slavery International for its project to work with a local partner, Timidria, to establish and provide ongoing support for six community schools in some of the poorest parts of Niger, which is one of the poorest countries in the world. These schools provide the first ever opportunity for children of former slaves in the region to go to school. In the schools they are taught alongside the children of former masters and this helps to break down the ingrained discrimination that has made slavery such a persistent abuse of human rights in Niger. The curriculum emphasises equality and human rights and a key requirement is that at least 50% of the children involved in the schools are girls. In 2009 almost 400 children were enrolled in the schools and, although they are free for all children, the parents are heavily involved in maintenance of the schools, latrines and play areas. Plans for the future of the schools include using the facilities to provide evening literacy classes for parents and the local community and to promote more links with schools in the UK and other parts of Europe. It is only regular support from people like you and your team that we can ensure that Anti-Slavery International and Timidria can continue to fund these schools and at the same time contribute to the final elimination of traditional forms of slavery and discrimination in Niger and many other countries. This is particularly relevant at a time when a long term drought in Niger has meant that crops have failed throughout the country and both water and food are in dire shortage. You can see some pictures of the schools and their work at http://www.antislavery.org/english/donate/niger_schools_appeal/default.aspx and http://www.antislavery.org/english/donate/niger_schools_appeal/schools.aspx . The Nothing and Everything website is a great resource for bringing the work of One Voice for Freedom and the two other charities to the attention of many people and at the same time provides plenty of feedback on your group’s activities. We certainly hope that you will go on from this success to new and greater heights. I was struck by the comments of Britain’s premier mountaineer, Chris Bonnington, encouraging you to “move on to some real hills”. A little unfair I thought but certainly an encouragement for a new challenge. Once again many thanks to all concerned for the fantastic result and we look forward to hearing of your next venture. One Voice for Freedom is dedicated to abolishing modern slavery around the world. By raising awareness and fundraising OVFF support the work of organisations such as Anti-Slavery International who campaign and lobby against all forms of modern slavery, free enslaved children and adults and work together with freed slaves to assist them to establish their lives in freedom, safety and dignity. I thought you might like to have some feedback following the Three Peak Challenge. You raised around £3,500 for edukid! 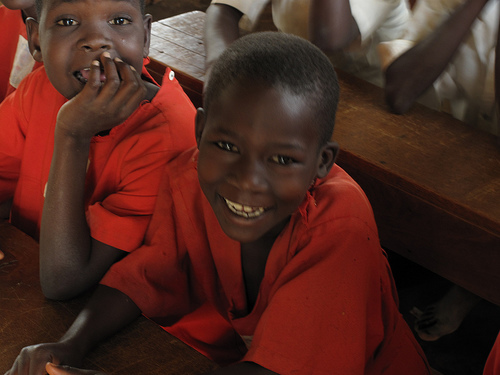 20 children in Uganda being able to attend school for one whole year. This money will pay for their school fees, exam fees, health care, accomodation (where needed), food, uniform, scholastic materials, and shoes. For each of the 20 children it will last them for a year! 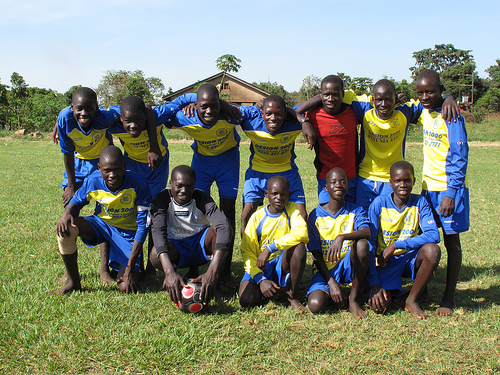 The children we help come from the following catagories: former child soldiers/former abductees/orphans/child led families/HIV/AIDS. For each of the children you have helped their life expectancy will increase on average by 7 years. This is based on statistics that compares children in the developing world who recieve an education compared to those who don't. I can't thank you all enough. It is soo hard to raise money and find supporters to sponsor a child. THANK YOU SO MUCH!!! I hope the legs are working again! 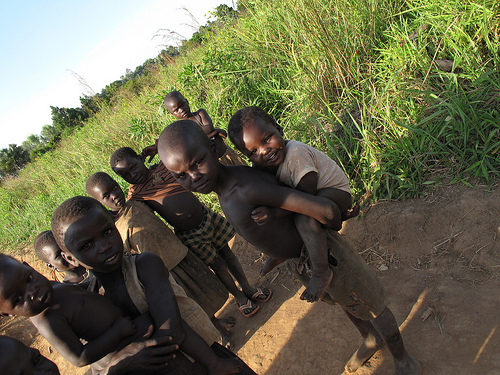 November 08 Mike Beatty and Chris Turner of Pulse Marketing travelled to Uganda to make a documentary about the Children of Gulu in Uganda. UPDATE NOV Feb 2010: Thank you to all those that made it possible for us to travel and make the film. We managed to raise all of the money through invoicing and some very kind donations from some industry friends including, Sherbourn, Runco and Twentieth Century Fox. After raising the money we have recently sent all of the sewing machines to Gulu (60 in total). These went to helping girls in vocational training most of whom were former abductees from the war. This tailoring project is aimed at those too disaffected by the war to be able to enter school. Many have children from the abuse of their abduction. We set out to invite a presenter and with help from another industry friend, found a sports correspondent who spoke the local language and proved to be a great help and support. The sewing machines were shipped with literacy programmes, and sports equipement. The football match went down a treat and an 11 aside game ended in a 1-0 win to England Michael Donne (our video companion and friend for the trip) has completed the video - We plan to send it to schools and businesses and now have it available to view online Click Here to View. We have managed to sponsor many more children since our trip - our 3 peak challenge is just another way of raising money and awareness for these deserving children. Edukid helps children affected by the legacy of war. In particularly we will be focusing our help on children who have been child soldiers, girls who have been abducted, orphans, child-led families and children infected with HIV. The project will help these children have an education, thereby giving them the tools and opportunities to find work and break out of the poverty they live in. This way they can support themselves and have hope of a brighter future. Nothing and Everything was set up to raise money for some deserving charities. Our aim is to raise over £100,000.00 within 5 years (Jan 2015) With your help we are confident this can be achieved!